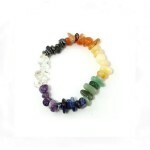 These Chakra Gemstone Bracelets are created to help people learn more about the healing properties o.. 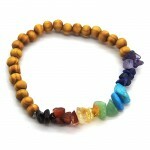 Here is our Chakra bracelet made from 6mm mineral stone balls secured in an elasticated band..
Elasticated wooden beaded bracelet along with chakra chipped mineral stones.. 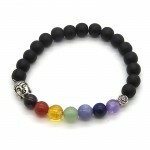 This Chakra Ball Lava bracelet is both beautiful looking and useful, as the stone lava is being used..
Om Chakra Obsidian ball bracelet all beautifully polished.Sized at 8mm.. 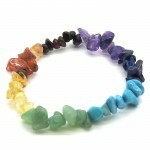 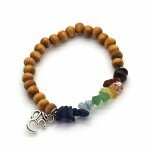 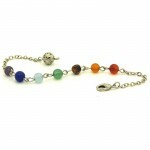 This bracelet features seven gemstones, each aligned to one of the seven chakras. 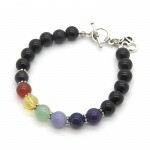 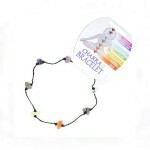 It is believed tha..
chakra natural stone chip bracelet..